A bit ago, I went on a much-needed dose of Vitamin D. So, my best friends and I hopped a plane to California. Since we were a bit early to the ‘port, we opted for a Bloody Mary at Pizzeria Piccola. This is one of Bartolotta’s more casual concepts and let me tell you, it’s a good one. TJ and I frequent the storefront in Wauwatosa. I also have to say we visit the airport location whenever we’re in the Southwest terminal. While it is airport food, it isn’t your average airport food. Mix: If there’s any place I’d figure would use a pre-made Bloody Mary mix, it would be an airport lounge. However, you’re not going to find that in the Milwaukee airport! Pizzeria Piccola makes this mix from scratch. It’s not the best mix but it’s good. It’s packed with horseradish and pepper which gives it a bit of a kick. The mix though is on the watery side but still holds a good tomato flavor. Garnish: Very simple garnish here although they could get very creative being in a pizza shop. A small slice of pizza on a skewer, some pepperoni, maybe some sausage? Anyway, none of that. Pizzeria Piccola garnishes with some olives, celery, pickle, lemon and lime. Chaser: I opted for a $2 Blue Moon chaser. Buzz: Although the drink didn’t have much of a vodka taste, it sure got me buzzing. I wasn’t alone either… my girlfriends were pretty buzzed as well! Size: 16 ounces of tasty Bloody Mary-goodness! Cost: Leave it to airport restaurants and lounges to over price everything. This Bloody Mary was $15 + tax! FInal thought: if you’re passing through the Milwaukee Airport, stop off at Pizzeria Piccola. 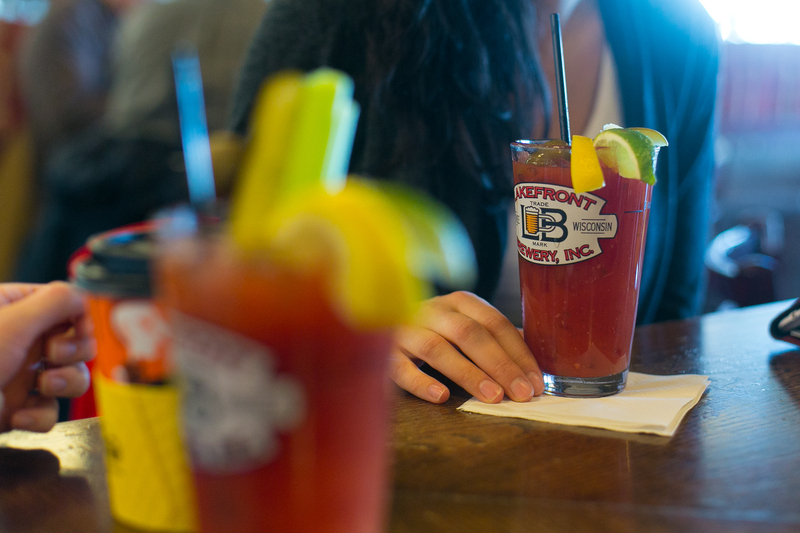 If Bloody Mary’s aren’t your thing, skip it! You won’t be missing anything. Try some pizza and some bread balls though. You won’t be disappointed! This entry was posted on February 21, 2015 by Shannon in Bloody Marys in the area.